Once in a blue moon, something emerges to catch our attention for major festivals like the Mid-Autumn Festival. This year, bunga telang or blue pea flower extract is the star ingredient chosen by Chef Alex Chan of The Emperor Chinese Restaurant, Dorsett Grand Subang for his handcrafted mooncakes. 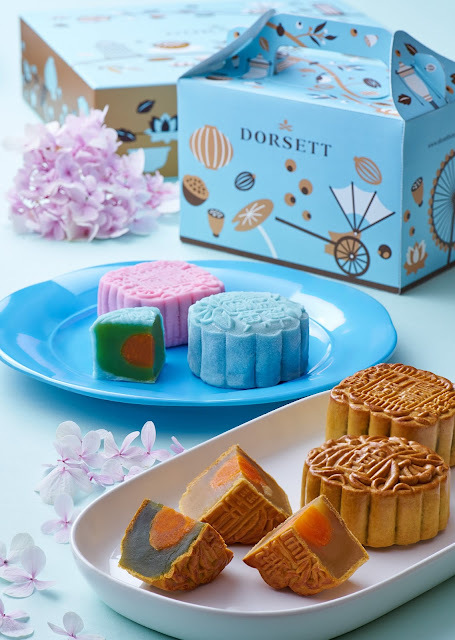 The natural floral extract gives the Crystal Skin Pandan Lotus Paste with Single Yolk mooncake that distinctive Dorsett blue. Available until 4 October, you can buy the halal mooncakes in boxes of 2 or 4 pieces. In line with current health conscious times, the lotus paste is not overly sweet and just a small wedge or two of a well-made mooncake should be amply satisfying. Dorsett Grand Subang also has 3 new baked mooncakes to offer: Six Coarse Grains Paste, Coconut Pandan Paste with Single Yolk and Green Tea Paste with Single Yolk for those who want something inventive yet familiar in taste. Walnuts, melon and pumpkin seeds, rolled oats, black sesame seeds and sunflower kernels packed healthy crunch into the Six Coarse Grains Paste mooncake. Again, the confection is less sweet on the palate and rich in Omega 3 from all those nuts and seeds. Fragrant pandan leaves and the inherent sweetness of coconut combined to create the unique Coconut Pandan Paste mooncake. Locals will find great appeal from the enticing pandan aroma and lush coconut creaminess when they bit the festive treat. Green tea paste is rather common in modern mooncakes but nobody would complain since green tea is a much vaunted antioxidant and high in Vitamin C. We loved the mild astringent tea aftertaste of this mooncake paste. More trad versions such as salted egg yolks embedded in low sugar white lotus paste are also available alongside red bean paste and pandan lotus paste. The mooncakes come in a pretty Dorsett blue and matt gold box adorned with whimsical motifs. Prices start from RM27 per piece onwards depending on your choice of mooncake flavours. For information, call tel: 03 5031 6060 x 1954. Besides Dorsett Grand Subang, you can buy them from Dorsett Kuala Lumpur, Dorsett Putrajaya, Silka Maytower KL and Silka Cheras KL.